It was a most opportune evening to discover D-48 Bistro (48th & SE Division). Saturday night was fairly stultifying, with the temperature only grudgingly inching back down from its angry mid-90s apex of the afternoon. 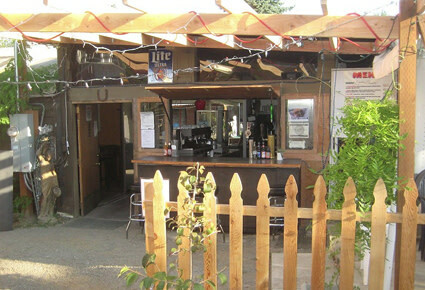 The prospect of sitting outside, sipping an icy cold pint of Burnside Oatmeal Pale Ale ($3, cheap!) whilst watching moths bounce off a naked bulb proved to be a biological imperative. Fortunately, drinking buddy Lucy was keen to try this place that she’d spied from the nearby Landmark Tavern. D-48 Bistro is part of a food cart village that looks like it’s putting down some roots. In the casual courtyard setting, overheated patrons lollygagged at tables, the nearby gurgle of a fountain providing a cooling accompaniment. 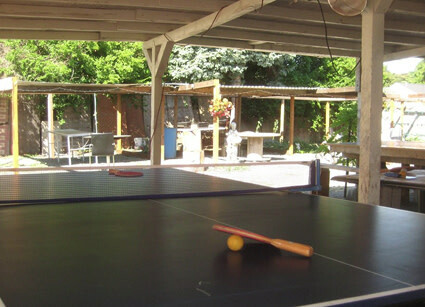 The rambling structure, comprised of a small bar, a covered sitting room with a couch and flat screen TV, and a charmingly slapdash back patio with ping-pong and pool table, sits betwixt 7 Hills Turkish cuisine and LeRoy’s Barbecue carts. The menu is basic burgers and pressed sandwiches (all $5-6) with three rotating taps ($3) and tall boys of Rolling Rock ($2). That’s it. 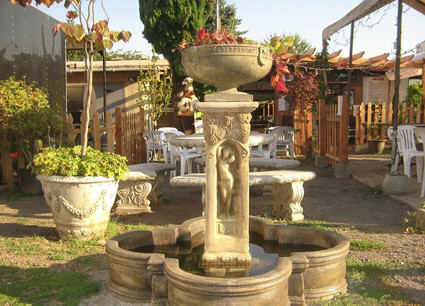 The back patio is spacious and resembles a reasonably well-kept SoCal junkyard, with plenty of long tables, a couple of conversation circles surrounding fire pits, and some random statuary placed at strategic points. During my visit, a flock of older folks in the covered portion of the patio hovered around a grey-haired gent playing oldies like "Autumn Leaves" and "As Time Goes By" on an electric piano, occasionally singing along. Aside from the statues, a Goodwill sofa, several strings of Christmas lights and an Elvis poster represent the extent of the decorating efforts. And I dug it. Sitting under the anomalous Yuletide glow with a cold beer, listening to gentle music, it seemed as if I could be in Spain, Mexico, or at least a friendly flea market at a nameless Southwestern cantina. The owner (Larry? Gary? Jerry? Harry? Terry?) told me he plans to stay open year-round. I found it difficult to picture this same sultry scene during a furious episode of February wind and rain, but I’m willing to suspend my disbelief. I don’t want to be a fair-weather friend.